If you’re reading this, then you’re likely looking to buy tickets to a concert that will sell out. We’ve got you covered here with a few TicketMaster tips on how best to buy tickets on TicketMaster fast, and how to get the best seats possible at the cheapest prices. 3 When tickets go on sale, don’t listen to TicketMaster, use multiple browsers! Check TicketMaster for presale opportunities, fan club presales, special credit card presales and Facebook TicketMaster presales, among others. Get the App (avoid the security code, instructions below). Check frequently; presales and special offers for different credit cards come and go. Save the direct link to the event page and have the general on-sale saved in your calendar. Have an account created on the website before trying to buy tickets. 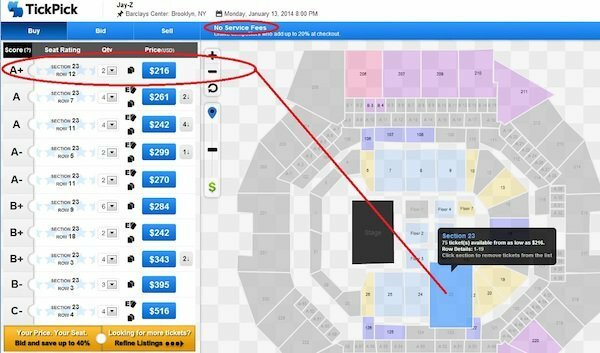 Shop around: compare ticket prices on TicketMaster vs. other ticket sites (tips below). TicketMaster presale codes are easy to find when you’re looking for the credit card presales; however, these presale codes won’t work unless you have one of the actual credit cards. For the TicketMaster American Express Presale you can enter the code: INGOLD. This will allow you to see the tickets, but when you get to the checkout you’ll have to use an AMEX card. Having these cards are the only chance to getting access to these specific presales, but Fan Club, Mobile, Facebook and other TicketMaster presales are fair game, and easy to find via a quick Google search. We at TickPick always are up on the latest concert tours being announced and the presale codes for those tours. When tickets go on sale, don’t listen to TicketMaster, use multiple browsers! Here’s why: let’s say you get tickets at 10:01am, and you have two seats in your cart. How do you know that those really are the best available seats? By using multiple web browsers (I recommend Google Chrome because it’s the fastest; but Firefox, Safari and Internet Explorer work, as well), you’ll be able to maximize your options. If you only use one browser with multiple windows or tabs looking for tickets in TicketMaster, the last window or tab that loaded is the only one that can move forward through the checkout process. Here’s the key: focus on one browser. Leading up to the on-sale, start refreshing the page often. If you have a smartphone, downloading the TicketMaster app for the Iphone or Android will be your best bet for speed and maybe even ease (as long as you already have an account). As we mentioned before, both TicketMaster and LiveNation allocate tickets specifically to mobile sales. This makes sense, since Ticket Broker Software, aka “bots,” don’t work with mobile devices, so this is one way to reduce the resale of tickets. 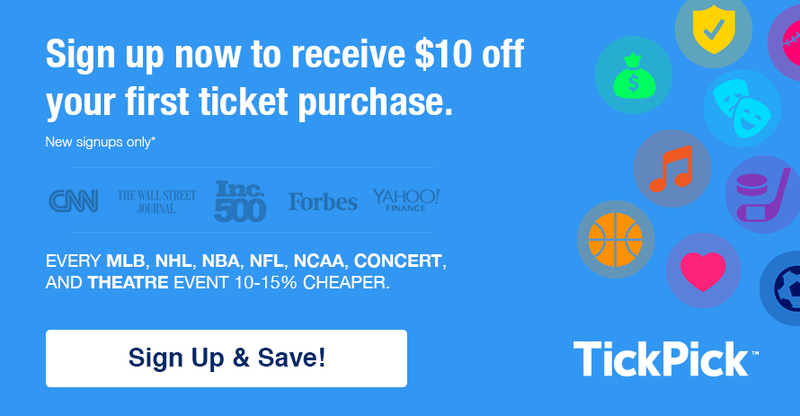 Buying TicketMaster tickets on the app is the fastest way to buy tickets online. That’s because by following some simple steps (provided by TicketMaster) you can avoid having to enter the security code, which apparently checks if you are a human. Unfortunately, this only works on the iOS app and not the Android app, as far as we can tell. Step 1. 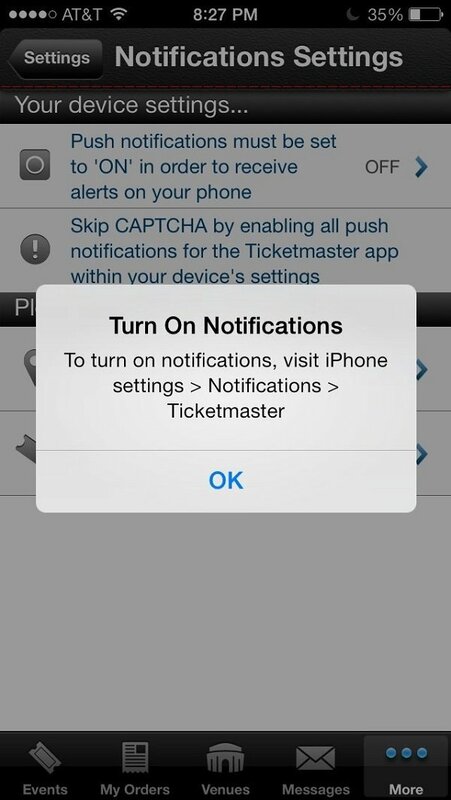 Exit the TicketMaster app and go to your iPhone settings (then)—>Notification Center—>Then select Ticketmaster or Live Nation and make sure to change the “Alert Style” from None to Banners or Alerts (see picture below). Step 2. 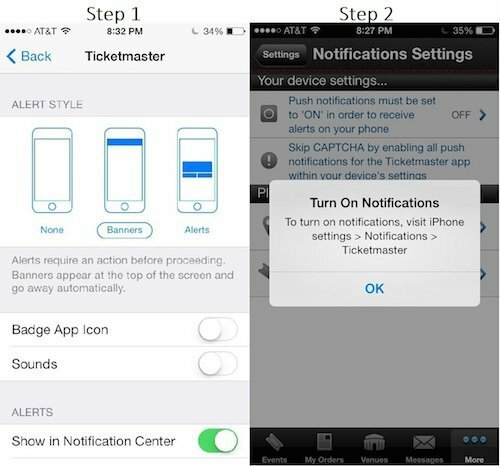 Then go back into your Ticketmaster / Live Nation app, go to More – > Settings -> Notification Settings and then select push notifications to “On.” Once complete, restart your app: say goodbye to typing security codes (note: on occasion you may need to enter the code, particularly if you refresh too quickly). Note: If you didn’t follow Step 1, then the screenshot labeled Step 2 is what you would see, so try it again. If you have problems let us know in the comments below. Don’t get greedy; it’s easier to get two tickets rather than four. Once you get through the security checkpoint, start searching for tickets in your other browser(s). Remember: the clock is ticking. The first page in the checkout process only gives you 2 to 3 minutes before you need to choose if you want to proceed or search again. The whole point of the second browser is to keep the tickets that you got in the first browser while searching for new tickets, so if time is running out on the first pair of tickets (before a second pair of tickets becomes available in a different browser, or if the second pair of seats is worse than the first), move through the process on the first pair of tickets. You’ll have roughly ten minutes of time to search for a second pair of tickets (in a different browser) while you hold on to the first pair in the other checkout. If within 10 minutes you don’t find anything better, we highly recommend that you buy the tickets you found in your first browser. You can spend an hour doing this, and ultimately you may not get anything better as other, better tickets are being purchased by others..
TicketMaster themselves recently published their own Insider Tips, and to be honest, we didn’t find any information that was particularly valuable. Additionally, they say one thing that we disagree with, which is to only use one browser. If I refresh a browser too quickly, I have had my IP address blocked for a couple hours, but this never happened by using multiple browsers. TicketMaster suggests that you use multiple computers, but unless you’re a ticket broker, there’s no reason to have to do this. Have you thought about what tickets may already be available for sale on other sites such as TickPick and Stubhub? We previously discussed how Ticket Brokers Get Their Tickets, and this may come to you as a surprise, but you can often benefit from ticket brokers. If you’re a pro, you’ll keep an eye on ticket prices on the secondary ticket industry. That’s because ticket prices often drop below face value, or available face value tickets may not be the best deal. For instance, for the upcoming Jay-Z concert, you should check TickPick before committing to the assigned seats & tickets that TicketMaster limits you to. If you were looking to spend around $200 a ticket, would you not spend $15 more to sit in a lower section and 10 rows closer? This situation may be a toss up, but you should always price shop, and yes, of course we’re biased, but thanks to our fee structure (10% to sellers and 0% to buyers) TickPick has the cheapest resale tickets 90% of the time. For more great tips on how to get cheap concert tickets you should check out our latest guide, which provides tips and info that can save you tons of money. For example, did you know that 80% of concert ticket prices go down as it gets closer to the event? With that said, we know you can’t always gamble and wait for ticket prices to go down (plus 20% of the time prices go up). So here’s our last tip: if tickets on TicketMaster sell out, there’s typically a small window where tickets are available at a small mark up. Once the concert is officially announced as a sell out ticket brokers know to raise their prices, but if you act fast you can get a good deal. And now that you know how to purchase tickets on TicketMaster, you will become the TicketMaster master! If you have any questions, leave them in the comments below and we’ll answer them!